Sabin's history began when its first citizens left their homes, many from across the ocean, and came with high hopes of making a home in a new land. Some had been poor farm tenants in Europe, and had heard of the Red River Valley and its fertile soil. They took advantage of the Homestead Act of 1862, worked their land with oxen and built shelters - log cabins or claim shanties. When the railroad was built through Sabin in 1880, places of business sprang up; a hotel, blacksmith shop, hardware and general store, lumber company, harness shop, and school, to serve the growing community. Not all of these early pioneers succeeded in their quest for a better life on this virgin prairie. Life was not easy; crops failed or were eaten by grasshoppers, blizzards that lasted for days were not easy to cope with. Some returned from whence they came. Others stayed, lived through hard times, worked long hours and became prominent citizens with large farms and beautiful homes. A larger school was built in Sabin. A Post Office and Bank were established. The village grew. Elevators and warehouses were necessary to store the farmers' produce. Churches were built, new roads, streets, electricity, telephones, business shops, water tower, new homes, and community hall were some of the improvements made. Sabin’s history is one of people working together to accomplish that which is best for all. 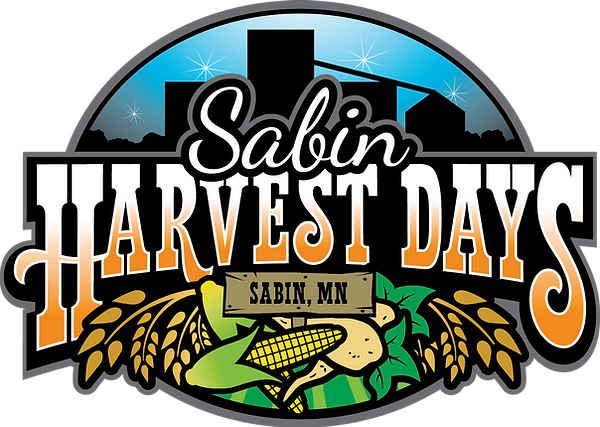 Sabin began as many people from Germany and other European Countries began homesteading in the area in the 1870's. At this time the Lake Superior Puget Sound railroad was being planned and two speculators from New England, S.G. Hardy and H.W. Webster, built a large building where they hoped the town would be. (The Block Building) The railroad was laid from Barnesville to Moorhead through Sabin in 1880 and in 1881 it was owned by the St. Paul, Minneapolis and Manitoba Railroad Co.
Sabin was platted out on land owned by Mr. Almy, who had homesteaded in Section 8 in 1875. He had named the area Elmwood for all the elm trees in the area The name Sabin was given the village in honor of Dwight May Sabin a state senator of Minnesota in 1871-1873 and a US senator from 1883-1889. The proprietors S.G. Comstock and Almond A White and their wives had Sabin platted out in the southwest quarter of section 8 and the southeast part of section 7 township 138 range 47. It was filed for record on June 27,1881. The first property owners, taken from a real property tax list from 1883, were Comstock and White, Hardy and Webster, Angus Murray, F.J. Burnham, L. Osbom, A.H. Halloway, M. Curfman and W.H. Leighton. The streets in Sabin were named after these early property owners, Osbom, Halloway, Almy and the township supervisor, Larcom. By 1917 the village had grown and become a large shipping point for the potato growers of the area It had 3 general stores, 1 hardware store, 1 meat market, a bank, 2 elevators, 4 potato houses, 1 blacksmith shop, 1 lumberyard, 1 harness and shoe shop, 2 hotels, a school, a post office, a candy store, and a barber shop. The village was under Elmwood Township government until 1929. When Sabin was incorporated as a village and the first election was on August 30. A.E. Green was the first mayor, Fred Scheel the first treasurer, C.F. Kuehl the first clerk, and the trustees were Otto Wright, William Messiner and L.G. Lobitz. The first meeting was held on September 9, 1929. At this time of incorporation the village received from Elmwood Township its share of funds, $700 for general corporation and $100 for the poor fund The officers were to receive $1.00 for each meeting attended with the clerk to receive $2.00. Meetings were held in the old village hall (Herman Abraham Building). Since that time many men and women have served faithfully on the council.